Consumption of DHA from fish oil is known to reduce blood pressure in children and adults. Docosahexaenoic acid (DHA) supplements given to mothers during pregnancy may lower systolic and diastolic blood pressure associated with overweight and obesity in their children, based on study results published in JAMA Network Open. Overweight and obese children exposed to DHA during pregnancy had blood pressures similar to those of normal weight children. Previous studies have reported that DHA consumption from fish oil has blood pressure-lowering effects, with evidence associating higher exposure to DHA during pregnancy or the first months of infancy with lower systolic and diastolic blood pressure at age 6 years. The goal of the study was to evaluate the association between prenatal maternal DHA supplementation and blood pressure during early childhood. The researchers completed a secondary analysis of the Kansas University DHA Outcome Study (KUDOS). The KUDOS trial included 350 pregnant women recruited between January 2006 and November 2009. During the double-blind placebo-controlled trial, the women were randomly assigned to receive 3 capsules of algal oil (600 mg DHA/day) or placebo. All women started the assigned treatment before 20 weeks’ gestation and continued treatment until the birth of their children. Parents of 190 children gave permission for continued follow-up when the children were age 18 months and follow-up continued until age 6 years. Overall, 171 children were included in this secondary analysis, including 89 children in the DHA group and 82 children in the placebo group. Diastolic blood pressure at age 5 years was lower in the DHA group compared with the placebo group, but the researchers reported that childhood weight played a significant part in both systolic and diastolic childhood blood pressure. Further analysis indicated that the positive impact of prenatal DHA exposure was limited to overweight or obese children (5-year body mass index >85 percentile). Higher diastolic blood pressure during childhood was found in overweight or obese children to mothers in the placebo group compared with children exposed to DHA during pregnancy (mean diastolic blood pressure 64.7 ± 1.23 vs 59.76 ± 0.91 mm Hg, respectively). In a similar fashion, higher systolic blood pressure was found in overweight or obese children exposed to placebo compared with children exposed prenatally to DHA (104.28 ± 1.37 vs 100.34 ± 1.02 mm Hg). 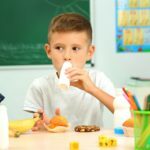 The researchers noted, however, that overweight and obese children of mothers in the placebo group consumed more sodium and were breastfed for a shorter period of time, limiting the conclusion that DHA was the only factor affecting childhood blood pressure. Kerling EH, Hilton JM, Thodosoff JM, Wick J, Colombo J, Carlson SE. Effect of prenatal docosahexaenoic acid supplementation on blood pressure in children with overweight condition or obesity: a secondary analysis of a randomized clinical trial. JAMA Netw Open. 2019;2(2):e190088.